Wildfires have forced more than 1,400 people to leave their homes in western Spain as dry, hot conditions spark warnings in other European countries. Towns and campsites have been evacuated as planes and helicopters help to tackle the blaze in Spain's Sierra de Gata mountain area. Nearly 80% of neighbouring Portugal is experiencing severe or extreme drought conditions, experts say. Meanwhile Germany is facing its hottest temperatures on record. Meteorologists say temperatures in Germany's south could exceed the country's all-time high of 40.3C (105F) on Friday. The current record was measured on 5 July in the town of Kitzingen in Bavaria. Some 330 firefighters and other emergency crew members were deployed as fires, fanned by strong winds, threatened homes in Spain's Extremadura region in the early hours of Friday, according to reports. 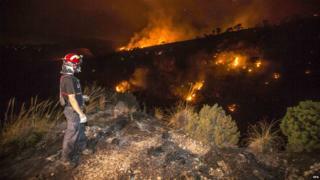 The blaze has burned more than 5,000 hectares (12,400 acres), local police said in a statement (in Spanish). Image caption Temperatures have hit 40C during a heatwave in the east of France. More fires destroyed about 3,000 hectares of forest and scrubland near the towns of Lorca and Cieza, near Murcia, in the south-east of the country. Exceptionally dry conditions, rising temperatures and moderate winds have also increased the risk of forest fires in Portugal, officials there said. The Portuguese Weather and Sea Institute said in a monthly report published on Thursday that average rainfall in July was only 3.5mm (0.1 inches). The usual amount for July is almost 14mm. Warnings are also in place for extreme heat in eastern France. But the UK is forecast to see temperatures peak at about 25C over the weekend. Where's hotter than where you are? Jonathan, Valencia, Spain: Today's temperature is 35C (95F) with 85% humidity. The weather has been exceptionally dry and hot. Last week we had a rain storm that gave 15mm of rain, which was the first rain for weeks. The last six weeks have seen temperatures between 30C through to 42C. David, Zaragoza, Spain: Temperatures in the city reached an all-time high recently at 44.4C in the shade. Fires in the surrounding region are a daily occurrence, many started by violent lightning storms and some started deliberately. Tempers are short, domestic incidents are up. Citizens seek shade in parks, bathe in municipal swimming pools or stay behind closed shutters. Bar terraces, normally full of people, are almost deserted - only the most hardened smokers are braving the temperatures. New laws have been brought in prohibiting air-conditioning to be on at night for many. Tony, Axarquia, Spain: Last week the temperature in the garden of my home hit 44C. Not as bad as August of 2014 when the thermometer hit its maximum of 50C. We're about 600 metres above sea level in the mountains and getting about two hours' wear out of a T-shirt! Neale, Algarve, Portugal: I can't remember the last time it rained here, maybe sometime in mid-May. However, contrary to the UK, we continue life without any water usage restrictions. All water here is metered and the water management here seems to be far more effective than in the UK. Even if it doesn't rain for another 18 months, the reservoirs will still hold enough water to supply the local population. Dan, south-east Bavaria, Germany: As an ex-pat living here all I can say is "scorchio". Since the beginning of July it has been in the 30s but today is special. Even my eyeballs are sweating! Tana, Toulouse, France: Following eight weeks of persistent heatwave, Toulouse is at meltdown. Houses are shuttered up in the day and no one ventures out unless essential. Praying for a thunderstorm to cool things down!